10 Positive Effects of Outdoor Signage. When it comes to bringing customers in, you’ve got to think outside. Not just outside of the box, but outside, literally. Outdoor signage can do a lot to help promote your business, entice customers, and improve overall sales. With an impressive amount of outdoor signage options available, from hanging banners to impressive monument signs to creative options like vehicle wrap signs, you’re bound to find just the right option for your business on the Above All Advertising website. To help you consider making the most of your out-of-doors marketing, here we’ll discuss some of the positive effects of outdoor signage and how to use them most effectively to promote your business. For retail businesses or businesses which are open to the public, one of the most obvious (yet also most important) benefits of outdoor signage is increased foot traffic. Your sign can and will make people who are walking or driving by want to stop and check out your business. For many, it will be the first indication that your business even exists. To increase the likelihood of walk-in traffic, be sure to place a sign where it will have maximum visibility in the place where your business stands. For instance, an LED menu board for a restaurant on a bustling pedestrian street can be a huge draw for passers-by on foot; however, it might not have the same impact on a busy thoroughfare where most people are driving. Even if your business isn’t a retail business or open to the public, outdoor signage can help by inciting curiosity from potential customers. For instance, say you have a business which isn’t open to the public, but you sell online. If you have an outdoor sign outside of your offices or warehouse with your logo, tagline, and website, chances are customers will give you a google to find out what you do or sell. The seed has been planted, so they say, and the next time they are in need of a relevant product or service, chances are, your business will be fresh in their mind. Bring more traffic to your website. Your outdoor sign can help build your business by bringing more traffic to your website. Often, customers will check out a business’s website long before they purchase their products or services. It’s easy to include your URL on your outdoor sign; this makes it easy for people to take a photo of the sign to remember your website, or to look you up on the spot on a smartphone. Increased web traffic can most directly improve your business if you offer e-commerce, but it can still improve your marketing reach and brand awareness even if you don’t. Gain followers on social media. Your outdoor signage can do more than just bring traffic to your website: it can improve your reach on social media, too. If possible, make sure your outdoor signage contains your social media information: include Facebook, Twitter, or Instagram handles or addresses (whichever platforms you use most frequently) in addition to your web address. People love to connect with businesses for special offers and to stay updated on news; by giving them information on how to follow you, they’re far more likely to actually do so. When customers follow you on social media, it acts as a constant reminder of your business, and once again, when they are in need of a relevant service, they will probably think of you more readily. A professional look for your company. Outdoor signage projects an image of professionalism for your company, whether you’re large or small, long established or just starting out. 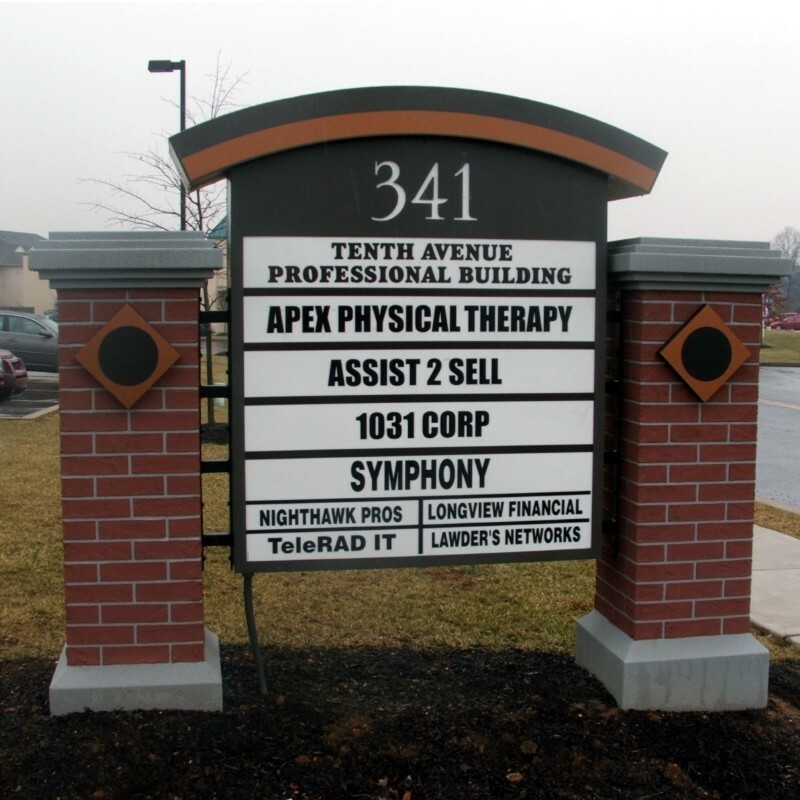 For example, if you’re long-established company, an assertive, beautiful outdoor sign like our monument sign can be a testament to the solidity and dependability of your business. But on the flip side, if you’re just starting out, an outdoor sign can help you project the image that you want your company to live up to. It lends an air of professionalism and legitimacy to your business, and can help you realize your goals. The nice thing about an outdoor sign is that it can advertise your business in all weather. Outdoor signs are designed to withstand the elements, so that they can broadcast your branding to the world regardless of whether it’s sunny, snowy, windy, or rainy. While the poor weather might deter people from being out and about on foot, they will still be able to see your sign from their car or from a mass transit window. An outdoor sign should be considered part of your branding suite. Put simply, when a customer sees an outdoor sign, it makes them aware of your brand. Combined with recognizing your branding from print ads, on promotional items you create, and on any other signs you may have displayed, this can increase brand recognition in customers’ eyes. Over time, this is a huge part in what can make a company a recognizable, household name. Promote specials or special events. Outdoor signs can help you promote in more targeted ways than simply announcing your business at large. They can also provide the perfect canvas for promoting specific products, services, special events, or sales. For instance, you might invest in a specific outdoor sign such as a half moon banner to advertise your big annual sale, or to highlight a specific product which you offer. This might be a permanent sign or something that you only put up seasonally. Outdoor signs, when done in creative or large scale ways, can really make a statement for your company and help you command attention. For example, when you commission a large sign such as a building wrap, customers won’t be able to help but take notice. But the scale doesn’t need to be immense to make a statement. Clever, eye-catching outdoor sign options such as vehicle wrap printing or advertising inflatables can also help you and your business make a splash. It makes your business easy to find. Let’s not forget one of the most important and positive effects of outdoor signage: it can help people out as they try to find you! While signage can draw in new customers, it also provides a functional service to existing customers who are trying to pull into the correct driveway. When your business is easy to find, it makes the entire experience of shopping more enjoyable for your customers. Conclusion: Outdoor signage can prove an incredibly effective means to help increase your business. Outdoor signage can help bring people to your business; it also works in the opposite way, allowing you to announce your business to the world. By choosing outdoor signage options as part of your branding strategy and marketing budget, you’ll be doing your business a strong service that will help it succeed in the long run. So be sure to check out the many signage options available on the Above All Advertising website! What type of outdoor signage does your company use?